Helene Wecker has written a book about a subject matter I have definitely not come across before. Our two main characters in this novel are considered fantastical creatures - beings out of stories or legend. The Golem is made of clay, exactly to her master’s requirements. She can feel the fears and desires of all the people around her, but most importantly she can feel those of her master, allowing her to act upon their wants more swiftly. On a boat heading for New York City, the Golem is awoken by her master. Unfortunately, he more-or-less immediately falls to the floor with a ruptured appendix, which kills him and leaves the Golem alone in the world. On her arrival to NYC, the Golem runs from the authorities and ends up in the Hebrew part of town. She is recognised as a Golem by a local Rabbi, who takes her in and helps her to live discreetly. The Djinni is a creature made of fire, used to roaming the deserts of Syria. In New York City, in the neighbourhood known as Little Syria, Arbeely Boutros the smith is given a flask to repair. Before he can touch it with any tools, the flask releases a man who claims to be a Djinni. Arbeely chooses to believe the Djinni and, when he sees what he can do to metals with just his hands, hires him as a help in his shop. Both of our creatures display huge uncertainty and have great difficulty integrating into their new American society. Keeping their identities secret and finding a way to live quietly turns out to be a full-time challenge. When they take the risk and allow themselves to make friends with others, inevitably they end up regretting the decision. Both creatures manage to hold down a job suited to their abilities, but feel there is something missing. It is incredibly hard to blend into a society to which they obviously don’t belong, having trouble with relationships especially. 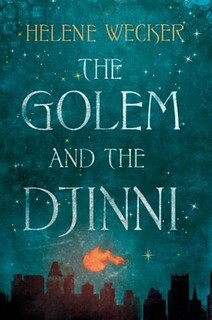 Even though these creatures are, evidently, difficult to live with or around, there are so many people in their respective immigrant neighbourhoods who are willing to give the Golem and Djinni a chance, who will look past their strange habits and try to be helpful. The sense of community is heart-warming. I did very much enjoy Helene Wecker’s style of writing. It’s rather plain and straightforward, encouraging contemplation and patience, but the way she writes the characters’ thoughts and feelings is spot on - very perceptive and believable. The great internal struggle going on inside both the Golem and the Djinni is realistic and made me feel empathetic towards them. I really invested myself in the futures of these creatures, and felt concerned for their safety. The novel spans different time periods to create a full, and lively overall picture exploring the Arabic and Jewish cultures. By the end, all the stories come to one big climax - crossing over uncannily into each other’s narratives - and the ending was splendid and satisfying. This post was written by guest blogger Jemma.